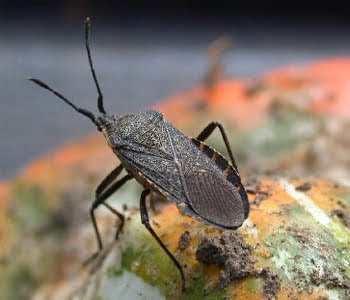 Life Cycle: Squash bugs are ‘true bugs’ in the Order Hemiptera. They overwinter as adults in the soil and duff on field edges and emerge when weather warms. Eggs are brown to red, and are laid in midsummer on the undersides of leaves. Eggs get darker in color as they approach hatching. Nymphs go through five instars to get to the adult stage. Nymphs have a red head, green abdomen, and black legs in early instar stages. The head turns to black in later instars, and the body and abdomen turn gray-green with black legs. Adults are about 5/8” long, gray to black in color with brown and orange stripes on the sides of the abdomen. Adult Squash bugs are sometimes confused with Stink bugs, as they look similar and both emit a foul-smelling odor when crushed. There may be a partial second generation produced in one year, depending upon climate and weather. 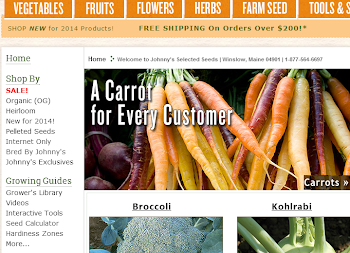 Plants effected: Cucurbits. 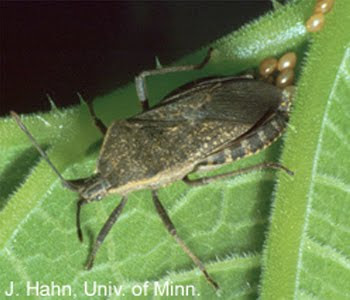 Squash Bugs prefer squash plants over other cucurbit crops but can be found on all of them. Control: There are natural enemies to Squash Bugs. A tachinid fly, Trichopoda pennipes, is a predator of several species of true bugs, including the Squash Bug. Adults have a bright orange abdomen and velvety head and thorax. Adult females ‘hover’ over cucurbit plants looking for a host to lay eggs on. She lays one to several eggs on the underside of the bug. When the egg hatches the larvae burrows directly from the egg into the host’s body. Only one larvae survives to infect the host. The maggot exits the host's body and drops to the ground where it pupates into an adult fly. The host bug dies shortly after the maggot has exited. There can be multiple generations per year of this natural enemy. A maggot may overwinter inside the host body to emerge the following spring. A parasitic wasp that lays eggs in the eggs of the Squash Bug is also a natural enemy. Neither of these predators is available commercially. Encourage native populations by avoiding pesticides. The pink-spotted lady beetle, Coleomegilla maculata, is widely distributed throughout the mid-Atlantic, southeastern, midwestern, New England and southern Ontario regions of the United States and North America. It has a wide range of prey, including Squash Bug eggs. Be aware that it’s diet also includes pollen. 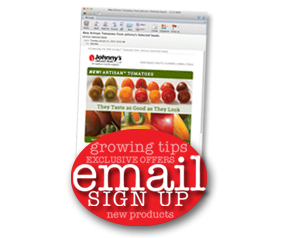 If a population explosion of Squash Bugs occurs and pesticides are called for, then the following can be used: #9370 Safer® Insect Soap and #9336 Liquid-Rotenone Pyrethrin Concentrate (only for use on nymphs). This pest is very difficult to control with pesticides in the adult stage. Pesticide controls are best used when early instar stages are present. In small infestations, handpicking is the best method for control. We'd an enormous German born cockroach issue once we moved in to our rental in addition to By Aside could make all of them disappear whenever a numerous company couldn't. Rely on them let's focus on our regular support and still have no difficulties with any bugs any more. Recommend Mosquito Control Services Leander! !